“And Elijah the Tishbite, who was of the inhabitants of Gilead, said unto Ahab, As the LORD God of Israel liveth, before whom I stand, there shall not be dew nor rain these years, but according to my word” (1 Kings 17:1). Heaven has windows which can be open or shut. If shut, there will be no rain. Rivers will begin to dry up and this will lead to famine and death.One way God judges is by shutting the windows of Heaven over the offender. In Amos 4:6- 9, God says He can open Heavenly windows for some and shut it over some. That means, while some are crying that things are too hard, others are feasting, celebrating and saying things could never be better. 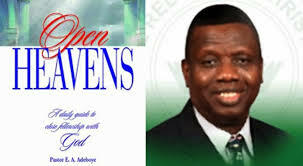 This year, the Lord will open the heavenly windows over you, your family, business, ministry, etc. Tithing is one medium of opening the heavenly windows (Mal 3:10). God’s anointed prophet can also open or close heavenly windows. This is one reason you must carefully relate with a genuine man of God. Just one pronouncement is all Heaven is awaiting before deciding whether to open or shut the windows over the person, city or nation in question. Elijah used his delegated spiritual authority to shut heavenly windows over his land (1 Kings 17:1). While several people were dying of hunger, the widow of Zarephath was becoming fatter. This year, as people complain of hunger and lack, you will be celebrating abundance in Jesus’ Name. Ultimately, God, the Owner of Heaven has the key of David to open or shut the Heavenly windows (Rev 3:7 ). Elijah exercised his authority and put the nation into famine just to get them to repent. Do you know that as long as you remain in right standing with God, and please Him in all you do, you can shut the Heavenly windows temporarily over individuals, loved ones, cities and even nations just to compel them to accept the Lord Jesus Christ? This is one key believers have but many have not been using. It is high time some loved ones were compelled into the Kingdom of God by the application of the key of David. Take this step today and prayerfully follow it up. And the Kingdom of God shall be enlarged. Let the windows of Heaven be shut over all my unsaved loved ones till they humbly turn their lives to Christ. This entry was posted in Christianity and tagged adeboye, babalobi, Babatope Babalobi, Bible, Bible study, christian prayers, devotional, Devotionals, God, good news, Holiness, holy spirit, Jesus, open heavens, open heavens 2014, pastor adeboye, Prayers, RCCG, Religion, Save the World, spiritual warfare, Success.